Fresh Water Capacity: 78 Gal. Gray Water Capacity: 71 Gal. Black Water Capacity: 52 Gal. Water Heater Capacity: 10 Gal. Propane Tank Capacity: 28 Gal. Exterior Storage: 121.7 Cu. Ft. Overall Length: 37 Ft. 6 In. Gross Combined Wt Rating (GCWR): 30,000 Lbs. Gross Vehicle Wt Rating (GVWR): 24,000 Lbs. Gross Axle Wt Rating (GAWF) Front: 9,000 Lbs. Gross Axle Wt Rating (GAWR) Rear: 15,500 Lbs. 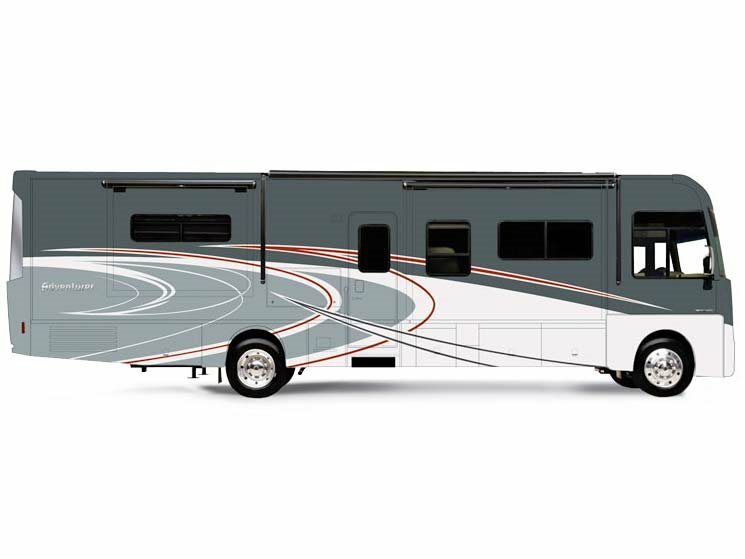 The Adventurer® brings a true luxury motorhome experience to the Class A gas market. Three floorplans ranging from 35 to 38 feet are loaded with amenities and smart features that make life on the road more enjoyable, such as Corian® countertops, MCD solar / blackout roller shades, and TrueAir® maximum comfort air conditioning. The exterior is also a feast for the eyes with multiple full-body paint selections, stylized aluminum wheels and chrome accents. Each floorplan has expansive storage—both inside and out— and three slideouts to expand your living space. Make your move to the head of the class in a new Adventurer.